Chief Minister Pema Khandu today launched the third leg of Arunachal Rising campaign here at Pobdi village on his Jan Sampark Yatra accompanied by Union MoS Home Kiren Rijiju, Tourism Minister Jarkar Gamlin and Dy Speaker Tumke Bagra. 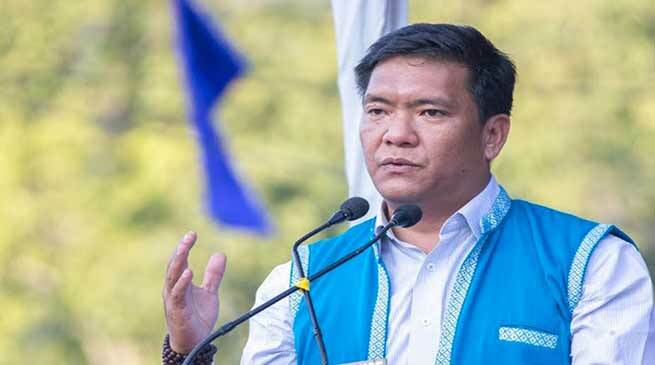 Speaking at the event, Chief Minister said since attainment of statehood, Arunachal has never seen government coming so close to the people as we see today. He said due to rigorous Arunachal campaign unleashed by the state government, people are becoming more aware about the schemes and policies of the government and coming forward to avail its benefit in large numbers. He said under Sarkar Aapke Dwar camps, it is now the government offices that are reaching to people at their doorstep and not the other way round. Chief Minister further said all salaried people working under the state/central government are ‘servants ’ of public irrespective of whichever position they occupy in the government and Chief Minister being the ‘Mukhya Sevak’. He said earlier mindset of government officers and elected officials revering themselves as the masters of the people must be done away with. “We (elected officials and govt employees) all are in our respective positions to serve the public and not to take benefit out of them or in their name,” said the CM. Chief Minister further said the Team Arunachal government is always focused on its performance and on being accountable. He said every two months the Chief Minister has to report back to PMO on his performance and on any shortcomings has to make improvement. He said the present state government is also determined to demolish the institutions of corruption that has existed for long in the system. He said for every penny received from the centre, the state government stand fully committed for its accountability. Chief Minister said two important projects related to connectivity – all weather road from Nyorak PMGSY road to Kodum-Nikte CO Hqs and 2-lane road from Nigmoi to Aalo has been dedicated to the people today. He said several big connectivity projects under central scheme are being launched in the state. He said Rs 440 crore worth PMGSY projects are being executed in the state and once the fund is used, another Rs 600 crore projects of roads are waiting to be immediately sanctioned. On Potin-Pangin road, Chief Minister said people must realise that the delay in the execution of work is not due to any lapse from the centre but from the state government. He said work was allotted in 2012 without any proper norms and land acquisition process without being completed. He said now under his leadership, the entire process of project execution is being overhauled and wherever misappropriation of funds and norms has been overlooked are being corrected. He said now the centre has sanctioned funds for the projects in three packages for which the tender will be executed by February 9 next. He also said the pending Potin-Project has caused huge expenditure on state exchequer with Rs 60 crore being released for the maintenance of the road. He said the money released could have been otherwise used for public benefit in the field of education or health had the Potin-Pangin road not gone through vast misappropriation. Speaking on development issues of the area, Chief Minister a separate airport for Siang belt will be worked out soon and promised to create Divisional Commissioner (Central) by 2019. He informed that road from Aalo DRDA office to Darka of Rs 10 crore has received immediate approval at RE stage. He also said the science stream for Donyi Polo Govt College in Kamki has been implemented and from this year post graduate courses will also start. On public memorandum received, Chief Minister assured to fund the construction of 60-bedded hostel for Pobdi Secondary School and asked the district administration to immediately submit the estimate.